Manchester and several other local communities are experiencing minor flooding this weekend. The Maquoketa River in Manchester crested at 15-point-3 feet just after midnight Sunday morning. It was the highest crest for Manchester since last September, but not enough to affect businesses along West Main. The river could be seen just barely coming out of its banks in the Tirrill Park backwaters and Manchester Whitewater Park on Sunday morning as the water levels started to go back down. Schram Pond also saw high waters, leading the Hartwick Huskys to cancel Sunday afternoon’s ski show. 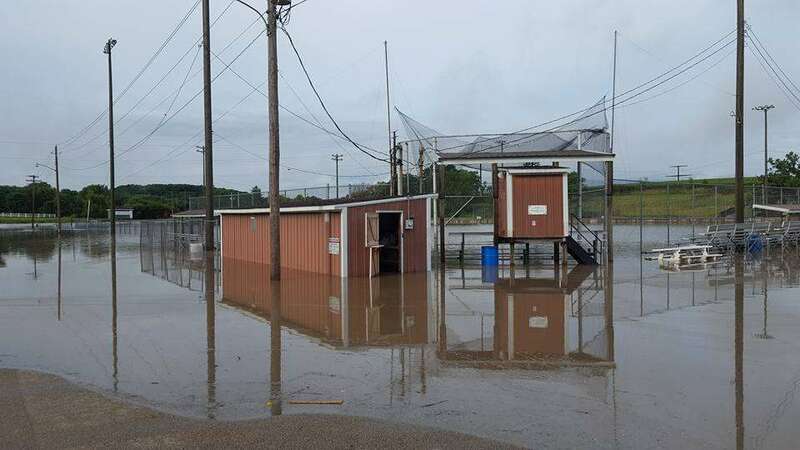 Minor flooding also reported in Dyersville at the soccer fields and in New Vienna at the ball diamond. If you have any photos to share, you can post them to our KMCH Facebook page. Meanwhile, in Independence, the Wapsipinicon River continues to rise. Major flooding is forecasted, with the river expected to crest six feet above flood stage at 18 feet Monday. The river should fall below flood stage Wednesday morning. At 18 feet, water would affect 1st Street and reach the bottom of the Highway 150 bridge deck. Manchester recorded about two-point-eight inches of rain Friday into Saturday, but our neighbors to the north saw much more. A swath from central Fayette County northwest up through Chickasaw County saw as much as seven to ten inches of rain in a 24-hour period. 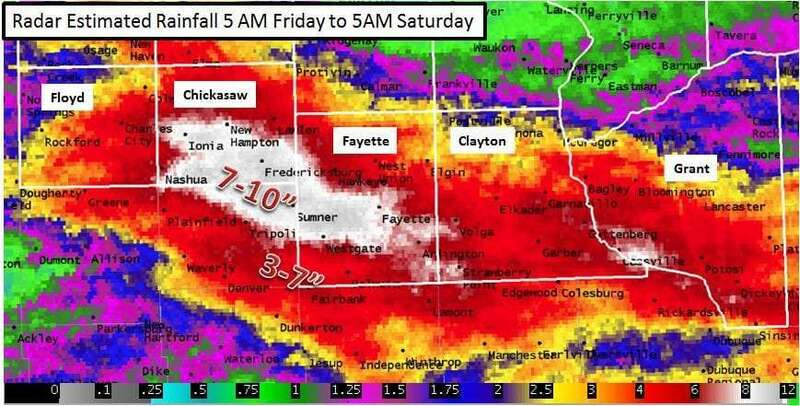 Three to seven inches of rain fell elsewhere in Fayette and Clayton counties, as well as northern Buchanan, Delaware and Dubuque counties. Several roads were washed out in Clayton and Fayette counties over the weekend, leading to numerous road closures. Major flooding is being reported in Garber and Littleport. Volga residents, who were evacuated earlier in the weekend after major flooding from the Volga River, were allowed to return to their homes Sunday.